Area where PIF facility is located. its intensity reduction on target. during weekends and short night-shifts. The PIF experimental area is located in the PROSCAN accelerator Hall as showed in the Figure below. Figure 1. PIF-PROSCAN Hall with the PIF Experimental Area. PIF area is equipped with the beam-line elements and PIF arrangement as showed below (Photo 1). Photo 1. PIF area downstream view with the last quadrupole magnets, beam monitors and PIF station. 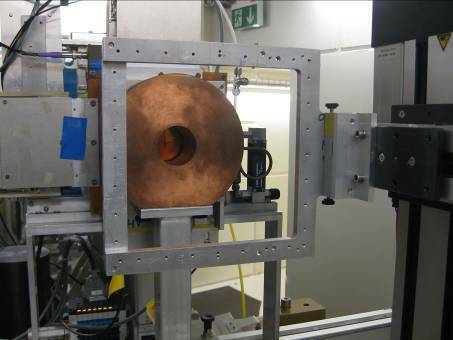 One can see the XY-table with beam collimator. and monitoring devices (Photo 2). Photo 2. 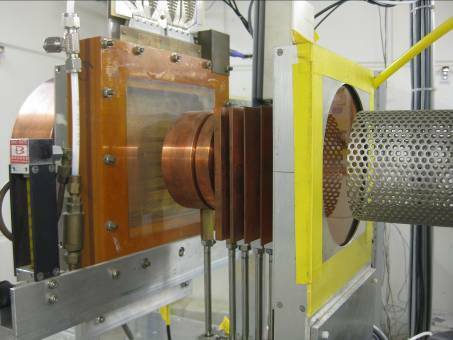 PIF arrangement with the ionization chamber, energy degrader and wire chamber. user's device under test (DUT) on the beam. Photo 3. PIF arrangement rear view with the XY-table, its movable arm and DUT sample holder. its position (see Photo 4). Photo 4. PIF area downstream view with the laser for sample centering and the beam dump. maximum current is limited to about 2 nA due to air activation in the experimental area. experiment individually: ionization chambers, Si-detectors, plastic scintillators. 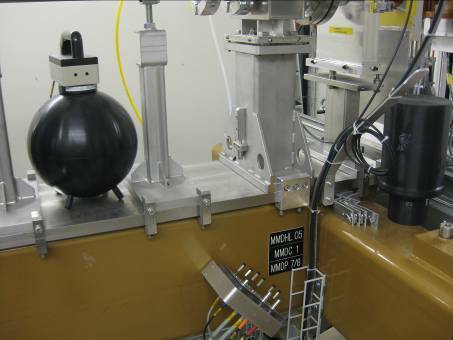 In addition, the gamma and neutron dosimetry is routinely performed (see Photo 5 below). Photo 5. PIF area neutron and gamma dosimeters. Figure 2. 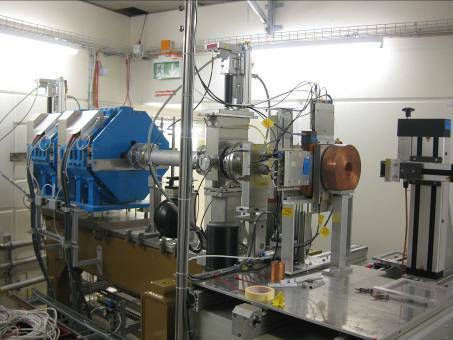 PROSCAN Hall, accelerator, beam-lines and tests areas. PIF site is marked as ‘EXP.’. 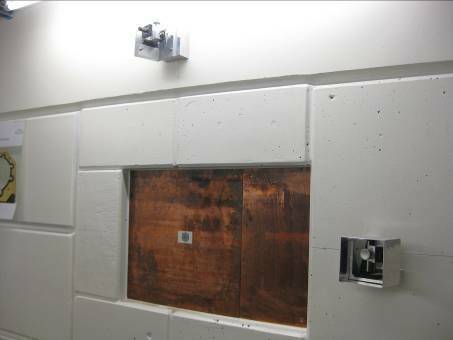 The irradiation is controlled from the experimental barrack located on top of the PIF area (see Photo below). Photo 6. PIF operator table in the barrack. Beam flux values are monitored through a set of counters and a PC-based data acquisition system. possible to perform fully automated irradiations with arbitrary proton spectra. Photo 7. One of the users tables. 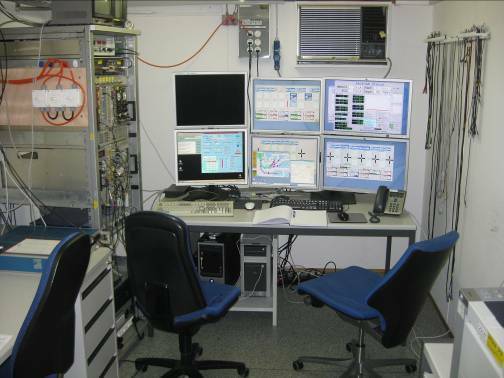 The experimenters have for their use and needs of their data test setup the second part of the PIF barrack as seen on the Photo above. 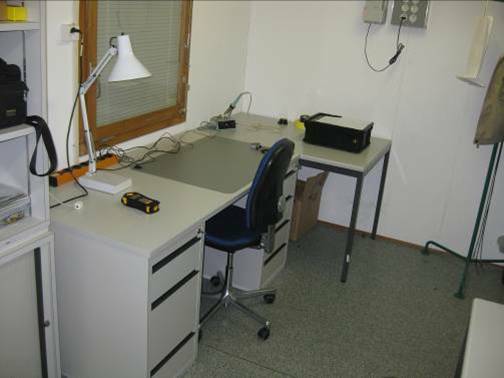 Standard laboratory and electronic equipments is also available. e.g. FWHM=2.4 MeV at 42.0 MeV, FWHM=5.6 MeV at 13.3 MeV.